I am scared to death of this twin birth experience. It has always been in my nature to avoid the doctor unless absolutely necessary. I don’t like taking medications unless it’s a “must”. I can’t stand being told something might be wrong with me, so “do this just in case”. No. I’m not going to put anything into or have anything done to my body unless it is 150% imperative that I do. Going into my other two births, I was completely prepared and ready for whatever was to come. I had a birth plan laid out that basically said I want the bare minimum (aka NONE) amount of medical intervention. There was literally no part of me that wanted pain medication, medical help or even an I.V. when giving birth the first two times. Not that I think there is anything wrong with any of the above. Personally, I just wanted to be my birth experiences to be as natural and free for my own body to control as they could be. They were both just that. The first was a lot more traumatic than my second in that the staff was a little bit more… pushy about wanting me to get some medication for pain and to speed the process along. The second was calm, quiet and wonderful. Now, at the prenatal appointments for the twins, I talk to my midwife about how different the birth process may be. She has delivered all my kids and I am so thankful that she is wonderful and tries her hardest to advocate for my wishes. But with multiples, it’s a slightly different story. 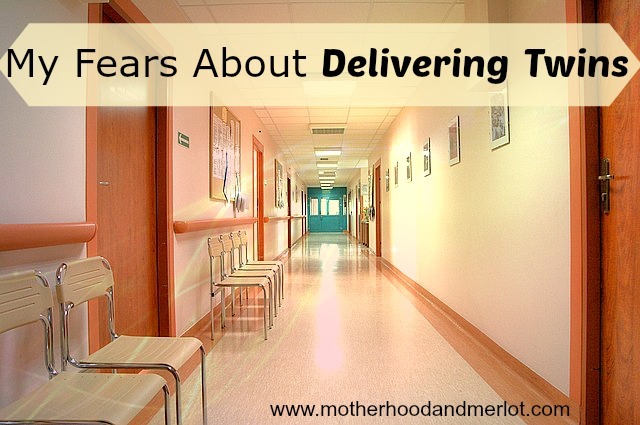 While there is still the chance that I can deliver naturally, they almost always want to give you an epidural and hook you up to all of these things in case they have to do an emergency c-section. They also might just schedule a c-section anyways if just one of the babies is turned the “wrong” way. I know, I know… they are doing all of this for the safety of the babies and the mom. I’m thankful for all the medical interventions that are available today in case something were to go wrong. But, I also know that people were delivering twins without the availability of a c-section for many years. A large majority of them had healthy babies, even if they weren’t both head down for delivery. I’m not scared of pain, or worried about how hard the contractions are going to be. None of that freaks me out in the least bit. What does scare me is a drug being injected into my spine that does not allow me to feel. The control freak in me HATES that. Plus, I get anxiety when I am pinned down and feel like I can’t move. Hello, aren’t c-sections just that? Women have had so many c-sections over the years and I know that they aren’t some extremely risky procedure. But, that doesn’t change the fact that being numbed and stuck on a table where I can’t feel and can’t control what’s going on doesn’t terrify me to the point of tears. “God is in control. It’s all about what’s safest for the babies.” That’s what I have to keep telling myself because it is the only thing keeping me sane thinking about it all. On the outside, you wouldn’t even know that I was petrified of these things. I go into natural birth like it’s nothing because to me, it’s something my body is controlling and doing naturally, and I have no fear in that at all. Thankfully, the midwife that has helped me deliver all my babies in the way that I wanted is so reassuring and helpful. She told me that if what I want is to deliver these babies naturally, then she will do everything in her power to make that happen. She also let me know that I have much more say and control in what happens then I think I do, which made me feel SO much better! My midwife always tells me she wouldn’t have ever guessed that I was worried about anything since I always seem so calm in our appointments. It has always been much easier for me to mask my emotions then to be the woman that’s flipping out in her prenatal appointment, walking out in tears or something. But, that the anxiety I have is completely warranted considering the circumstances. Now, if I can just get through all the worries I have about the actual pregnancy itself… one step at a time I guess. I am prone to worrying about everything unfortunately. I am so sorry you are feeling this anxiety! I had to have a c-section with my first since he stopped growing in the womb for some reason. I was so worried about his health that I didnt really have time to think about my own fears. It all turned out fine, but I can understand your fears since you kind of have to worry about it ahead of time since you know with twins they kind of push you in that direction. I know that they happen all the time, but I think since I was just able to do it completely on my own the first two times, and that’s something I really want out of my birth experience, it’s hard to think about something that is SO medically invasive. Oh my goodness, You are SO BRAVE! Keep letting your midwife be your advocate and pray for what you want. We’ll all be praying too! She is really in my corner, which I am so thankful for:) I appreciate all the prayers! This whole giving birth thing is certainly a time that evokes fear…especially with twins! But as you say, trust your gut and doctors to do what is best for the little ones. I had to have a c-section with my first because he was breech (despite my birth plan, to go at it naturally). I remember crying when I realized I wouldn’t have that unique experience, but found joy in knowing that my little boy would be better off. I also had to have a repeat c-section with my newest baby. I was considering vbac but after much research decided it was the right route to go…and luckily…since a c-section was needed anyway! It’s natural to fear the unknown, but I’ve learned that if you just go with it and hope expect the best you can get to that calm state of mind! Positive thoughts!! I will keep you in my prayers. Childbirth is very scary but I’m like you. Out of my 7 I had 4 natural. The times I had an epidural I either needed it for medical reasons or was young and didn’t know I had a choice. God made our bodies for child birth. Our bodies know what to do. I hope everything goes just the way you want it to. I wish I could give you a big hug! 🙂 You go mama! My mom had all 10 of her children completely natural and unassisted, which I admire so much and am hoping that this birth will just go smoothly enough where they will not have to perform any emergency procedures. I haven’t had a c-section so I don’t have any advice. Stay strong and have faith. My thoughts are with you on your journey. Oh I wish I could just give you a big hug! I’ll be saying lots of prayers for you over the coming few months! Having babies scares me too! I’m glad you have a midwife that is understanding and I hope your anxiety subsides. I had my water break and then had to be induced with pitocin with both. I didn’t like all of the drugs but I’m glad my babies were healthy. I also want to add that as a fellow control freak, I TOTALLY get where you’re coming from! I think that’s the hardest part about having a baby. You have to completely give up all sense of control and it’s all one big unknown! Thank you for sharing that! My first two birth experiences, especially my second, was just so wonderful and smooth that the thought of something drastic needing to happen freaks me out. I thought I was alone! I’m 30 weeks with twins and this is my first pregnancy. Before I conceived, my husband and I moved out of state where all of his sisters and mine have given birth. I was looking for a midwife before I found out I was having twins but ended up going to an obgyn for my first and second appointments it was hard not knowing anyone to get referrals from. When I started looking for a birth center and midwife that would help me through many twin pregnancy I was turned away by everyone I contacted, but feel that this wouldn’t have happened in my home state where natural birthing is highly valued. My hopes for a natural birth were shattered and I spent most of my second trimester in tears over the lack of control I felt over the situation. I’m fully on board with whatever is best for my babies and my health, but there is always the thought in my head that with the right support and knowledgeable personnel I could do this the way women have for ages. Unfortunately my drs and my husband seem to understand where I’m coming from. I’m pleased with the care that I’ve received up to this point, but have felt totally out of control…and afraid that I will be pushed to do certain things because these babies are my first so I don’t have a strong grasp on my rights and what’s available to me. As I get closer and closer to the birth of my twins I’ve tried to read as many experiences as I can find and draft a reasonable birth plan, but it’s true that information is limited in the area of multiple births. As for now I pay pray every night that baby a stays head down and I can carry the babies to term healthily. I wish I could give you advice…maybe when I have them I’ll have something to offer. But I wish you the best and at least feel better knowing I’m not alone!